The Cuisinart 655-35 chef's classic 13" x 20" double burner griddle has open design of the skillet which maximizes the cooking surface and makes it easy to rearrange food as it is cooking. It features durable hard anodized construction for fast and even heating eliminating hot spots. The 655-35 features Quantanium nonstick cooking surface which is reinforced with titanium for lasting food release, healthy cooking and easy cleanup. The solid stainless steel riveted handle offers perfect balance to provide exceptional control when gently tossing food and stays cool on the stovetop. The 13X 20 Double Burner Griddle Chefs Classic N-S Hard Anodized has many exciting features for users of all types. You can extend the lifetime of your 13X 20 Double Burner Griddle Chefs Classic N-S Hard Anodized with the purchase of a FactoryOutletStore Factory Protection Plan. See the 13X 20 Double Burner Griddle Chefs Classic N-S Hard Anodized gallery images above for more product views. 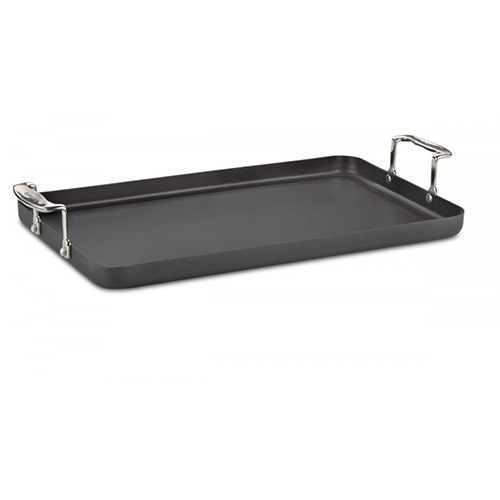 The 13X 20 Double Burner Griddle Chefs Classic N-S Hard Anodized is sold as a Brand New Unopened Item.